Sorry this post is coming so late! I got caught up cleaning the house and some other things and before I knew it, the day was almost done and I still hadn’t painted my nails for the post. Luckily the sun was still shining when I finished! Today is my first Flakie Friday, and I decided to start off with a flakie that is easily available to everyone. 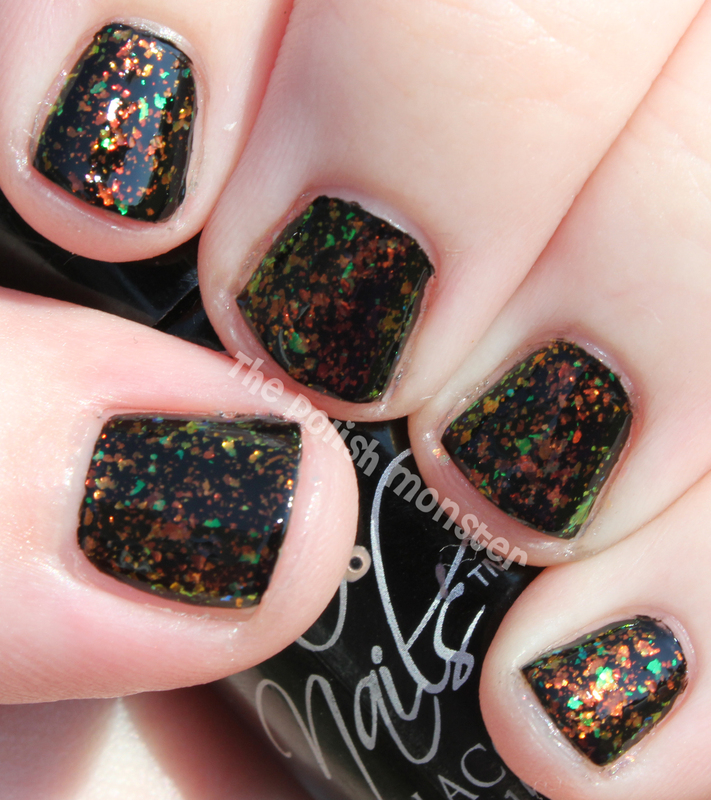 Chloe is part of Zoya’s Fleck Effect line from Spring 2012, along with Maisie and Opal. It can be found here. This is a beautiful flakie, that’s slightly different from the more common color schemes you’ll find. The flecks are mostly orange with a yellow shift, but there’s also the occasional yellow and green flecks to add some interest. Application is wonderful- the flakes are fairly dense and you really only need 1 coat. For these photos however I added 2 coats of Chloe over 1 coat of Cult Nails‘ Nevermore. If you’re looking for an amazing 1 coat solid black, check out Nevermore! It’s wonderful. Look at all those beautiful colors! Hopefully these photos can really show off how beautiful Chloe is! They were taken outside in full sunlight to really try to capture the colors. Now a lot of people will already know this, but if you haven’t purchased from Zoya.com before, you’re in luck! Use can use THIS referral link to get a free polish of your choice (maybe Chloe?). Also with the program, if you buy 2 extra polishes along with your free one, you’ll receive free shipping! Not a bad deal! As a disclaimer, I do receive sharing points if you use the link- but the more I get, the more goodies I can get for giveaways! Hi everyone! It’s my very first Mani Monday, and I decided to start off with a tutorial I’ve had bookmarked for awhile, the blood splatter effect. Why, in the middle of June, you ask? I’m a pretty big True Blood fan, though I’ll admit- I love the books more. That always seems to be the case though! Season 5 premiered on HBO last Sunday night. We had out of town family staying with us that week, so I wasn’t able to watch until tonight- so I got 2 episodes back to back. To celebrate the show’s return, I decided to turn to a tutorial by Dollface22772 (who most of you probably know because her amazing line of indie polishes, Dollish Polish). This tutorial was originally posted just before Halloween to celebrate the start of Dexter, but it fits True Blood just as perfectly! You can find the tutorial I used here: http://www.youtube.com/watch?v=47dWovqryvc. I highly recommend watching it! I’m not going to do a full explanation, but you can see her demonstrate the technique perfectly in the video. You can find Dolly here on facebook: https://www.facebook.com/Dollface22772. First off, you’ll need supplies! At least 1 straw, your polish (base coat and splatter coat), tape, some form of protective surface (I just used some foil), and wine. Ok, the wine is totally optional, but if you’re of legal age it’s always a fun addition (yes, I’m drinking from a tea glass… we don’t have real wine glasses. Don’t judge!). This picture is a little outdated- I started with Sinful Colors White, but had some streaking issues that multiple coats did not help. I removed it, and used Essie Marshmallow instead (totally smart right, replace the original with a sheer color that’s going to take 4 coats? Couldn’t have been the wine!). Anywho… you paint all your fingers your base coat (in this case, white) and allow to dry completely. I went ahead and used Poshe Super-Fast Drying topcoat to speed up the process. For having 4 coats, I had absolutely no trouble with smudges or other issues that normally plague me when I put that many coats on. I’m unsure if it’s just because Marshmallow is a sheer color and thinner, or if it’s a trait of Essie (I don’t have many Essies), but it was great to work with. Took forever to build up of course, but that’s not unexpected. Anyways, where was I… ah ha! Splatter time! So for the blood splatters, you simply make a pool of polish (a few large drops from the brush should do), and place the end of the straw in the paint, hold above your nail, and blow on the straw quickly and forcefully. This *should* cause the paint to splatter out. The distance from your nail determines the extent of the splatter- the closer you are, the bigger the initial blob. You’ll be able to see these size variations on the photos I’m about to post: my index and ring finger both have blobs from being closer. I did have a little bit of trouble with this- it definitely worked, but I think my straw (one that bends at the top) wasn’t ideal. It would take multiple tries to get paint out most of the time. Even with that, it was an east mani to do! I highly recommend watching the video to see the process in action. Of course since this mani was done in honor of True Blood, the *only* polish I felt was acceptable to use would be Zoya Sooki. In the books her name is spelled Sookie, but honestly 1 letter doesn’t make a huge difference! I adore that this polish is a bright, blood red. You can see the topcoat caused a bit of bleeding, even though I applied it after I gave the red time to dry on each nail. It’s not as noticeable in person, but on a macro shot it stands out very clearly. So that’s it for my first Mani Monday! I had a lot of fun with this one, and I’m happy to finally scratch one effect off my to-do list. This look can easily be switched around to different colors for completely different looks, like the 80’s neon paint splatter! Follow Polish Monster on Twitter! Enter your email address to follow Polish Monster and receive notifications of new posts by email.